This is a spectacular dinner party dessert or special celebration cake. 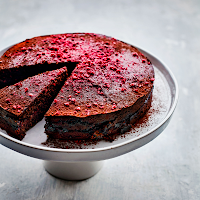 Raspberry-flavoured dark chocolate goes into the decadent mix, and a layer of fresh raspberry compote through the middle of the cake adds beautiful contrast. Serve with creme fraiche to cut through the richness. 1. Preheat the oven to 180°C, gas mark 4; line a deep, 20cm cake tin with baking parchment. Heat the raspberries and 50g sugar in a small pan with 1 tbsp water until broken down, then simmer for 6-7 minutes until jammy; set aside to cool. Meanwhile, melt the chocolate in a heatproof bowl set over a pan of barely simmering water; set aside to cool. 2. Beat the butter and remaining 100g sugar until light and fl uffy. Beat in the eggs, then the almonds, fl our and cocoa, followed by the soured cream. Fold in the chocolate until everything is just combined. Pour half the mixture into the prepared tin, then pour the raspberry compote into the middle, spreading it out but leaving a 2cm border clear around the edge. Cover with the remaining chocolate mixture and bake for 35-40 minutes until cooked. 3. Cool completely in the tin. Dust with cocoa powder and sprinkle with freeze-dried raspberries before serving with crème fraîche, if liked.